Why choose a Strada saddle for endurance riding? Precision-moulded shock-absorbent panels that react to heat and pressure by softening and adapting completely to the horse’s contours. 6 fits reflecting different BODY SHAPES, not simply different widths. Tree and panel design allow the horse to move freely in all paces, without creating pressure points that would compromise performance by causing muscle soreness. 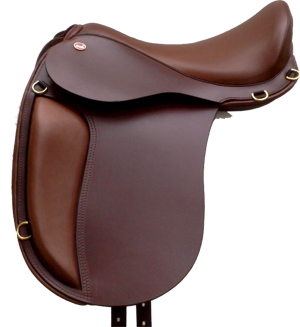 Seat & flap design, as well as stirrup bar placement, permit the rider to sit naturally, keeping rider fatigue to a minimum. A tired rider soon becomes unbalanced. To cope with the shifting weight the horse is forced to re-balance himself constantly. This uses valuable energy and therefore reduces endurance. The saddle sits very close to and “around”, rather than “on” the horse, resulting in superior stability, particularly on wider horses. Again, a stable load is easier for the horse to carry and stamina is therefore increased. Lightweight – an obvious advantage. Traditional looks increase the saddle’s usefulness: It does not look out of place in the dressage arena or the show ring. Although our “St.Christopher” Endurance Saddle bears the name of a specialist discipline, it is eminently suitable for those who simply enjoy exploring the countryside with their equine partner. Whether you are just going for a short hack or you are off on an extensive trail ride, we feel sure that you and your horse will benefit from the St.Christopher’s exceptional design. On a trail ride our endurance saddle will contribute immensely to the comfort of you and your horse. The saddle will be stable and you will be able to sit relaxed, free to simply enjoy the ride. The heat-sensitive panels will hug your horse’s back, the flexible tree will swing with his movement and you will feel at one with your horse, from beginning to end of even the longest trek. The D-rings will be useful for saddle bags, if you wish to carry provisions. All equestrian activity should be an enjoyable experience for the rider, as well as the horse. Nobody should make you feel that good saddles are only important for riders competing in specialist disciplines. A trail ride across varied terrain is demanding and you and your horse deserve the best. For further information please go to product info. For photos of the saddle in action, please take a look at the check out the Gallery.